If low power and Class A is what you seek, well then, this little tone monster might be just what you're looking for. Featuring our signature all tube reverb and reactive tone stack with tons of gain on tap! Perfect for recording too. Powered by either a single 6V6 or 6L6 being driven by a compliment of two 12AX7's, we've taken our signature first channel clean preamp, tuned the tone stack, added another gain stage, and a master volume just in case you need it. Nothing but your tone goes in here and comes out of that speaker. 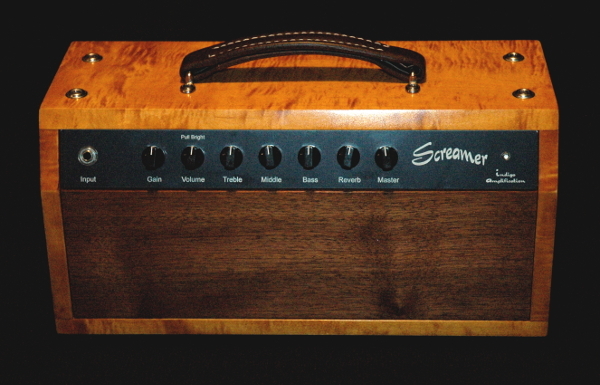 Shown to your left, configured as a 6 watt head in a custom flamed maple cabinet.